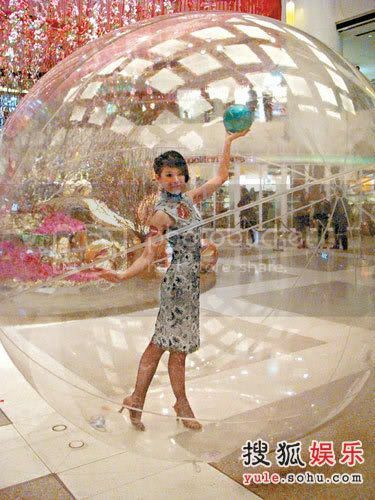 Myolie attended a mall function, and performed in a ball. She expressed that jobs from mall functions didn't decrease because of economy downturn. She revealed that on Chinese New Year Eve, she had to return to TVB City for the countdown. Hence, losing outside jobs. She expressed that company's event is a must to attend, don't really bother about the extra income. She also revealed that she had many job opportunities last year, hence she spent 7 figures on paying tax. Myolie was at Kin Tong attending a function. The committee had arranged for her to wear a golden Qi Pao to dance in a big transparent ball. She expressed that this is her first extra job in the new year. Asked if she will be visiting rumoured boyfriend, Bosco's, place during Chinese New Year? Myolie rejected and said: "I also don't visit during New Year, usually have to go back to the company to visit more." Thanks for sharing! I really love her dress, she looks so pretty! BTW, she looks absolutely gorgeous in her Qi Pao dress. 7 figures!? wahh, Myolie's earning quite a lot this year ^^ congrats!